The Hard(ware) Choice: Which way do you go? Tablets, netbooks, Chromebooks, laptops. 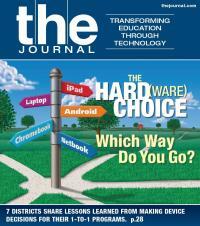 With so many choices in today’s ed tech landscape, how do districts select the right technology for their 1-to-1 programs? We speak to districts across the country who have invested in each of these technologies to discover the most important considerations and lessons learned. Our Space: Ban Cell Phones in Classrooms? Data-informed decision-making for the classroom is a great idea; but first the data has to be accessible and usable by people who aren't data experts. Several initiatives are tackling this problem, intending to make collected data more actionable for teachers. The teaching history using original source materials is something that used to only happen in the college settings, but now technology is making the open source materials more readily available. Here, we explore four technologies, from that are bringing photographs, journal entries, speeches, and other primary source documents direct to K-12 learners. Budget cuts and a shortage of qualified teachers are leading some school districts—both rural and urban—to turn to online AP courses to close the gap and expand their offerings to subjects such as art history and Chinese. Plus, a case study from one district that recently implemented a distance learning program for high school students. Technology can help educators train students’ focus away from rote memorization toward deep conceptual learning methods, which emphasize building on prior knowledge and making connections between concepts. Red Rock Reports President and CEO Jenny House discusses new federal requirements for evaluating principals and superintendents.